The level of organization a person needs to be productive or less stressed or happy varies from person to person. Once you have discovered what works for you, you will be able to maintain your system. Problems arise with being organized when the system doesn’t work with how you think, your schedule, your routines or your motivation. 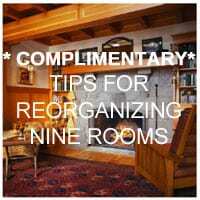 Working with a Professional Organizer can help you establish a system that meet your needs. Here is a video about one way to organize a home. Some of the ideas may work for you. Let me know if you tried any of the techniques in this video.